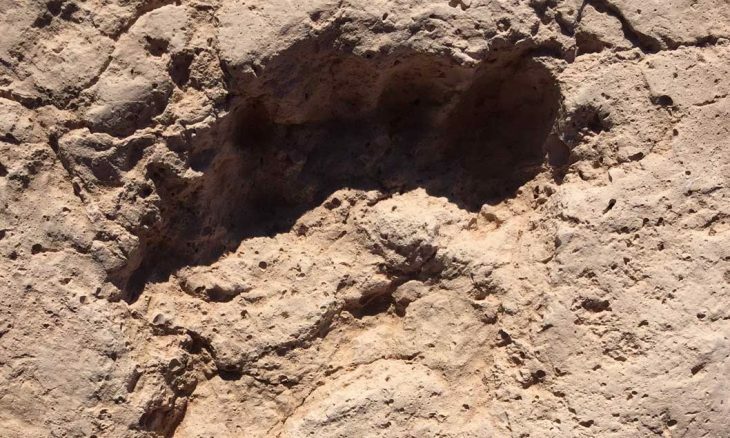 TUCSON, ARIZONA — A day’s work in an Arizona corn field some 2,500 years ago has been frozen in time, thanks to the footprints of some ancient farmers, their children, and even their dogs, which have been found perfectly preserved at a construction site just north of Tucson. The prints number in the dozens and depict the movements of several adults and at least one child, as they tended to their neatly arranged crops and the small irrigation ditches that watered them. 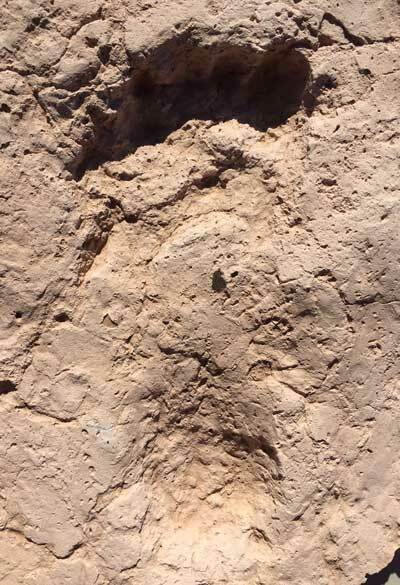 Discovered in November by archaeologists investigating a parcel of land near Interstate 10, the prints are likely the oldest human tracks yet found in the American Southwest. [See two related discoveries: Are these the oldest human footprints in North America? What’s more, the footprints provide a glimpse into the daily life of people who practiced some of the earliest agriculture in the region, in intimate detail. “One of the things in archaeology that we always wish for is a time machine — to go back in time and see what people really did, to look at a dirt pile and go, ‘So, that’s what they were doing,’” said Dan Arnit, the excavator who made the find. The barefoot tracks are distinct enough that the movements of specific individuals can be followed across the 15-meter-square field that’s been uncovered, Arnit said. In one case, a set of deep, large prints shows that a heavy adult male trod diagonally across the field, stopped to do some work on an earthen berm, or perhaps to open a weir to let in water, and then took a different path across the field and over the ditch. Another set of prints seems to have been made by an infant or toddler. And one print has a dog print inside it, likely made by a farmer being followed by his or her canine companion. The tracks were preserved in such pristine condition because of a sudden flood from a nearby creek, archaeologists said. The creek overran its banks soon after the prints were made, covering them in its uniquely mica-rich sandy sediment, forming a kind of mineralized cast. Archaeologists discovered the prints under this layer while researching the site before a road is to be redirected through it. “We knew two years ago [when the project began] that there was a lot of archaeology that needed to be addressed,” said Jerome Hesse, project manager for SWCA Environmental Consultants, which is conducting the study. 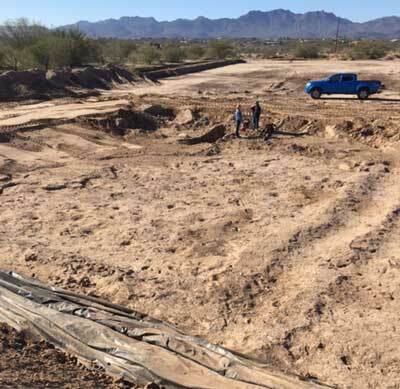 Previous research done nearby had turned up traces of multiple residences from the Hohokam, or Ancestral Sonoran Desert culture, dating back 900 to 1,000 years, he said. But at the site of the new roadbed, as the researchers dug deeper — and therefore further back in time — their test trenches turned up very little at first. “The area out here, remarkably, didn’t have anything in the trenches,” Hesse said. “So we scratched our heads and thought maybe this was an area that was being used for agriculture. “We don’t have a firm date, but during phase one [of the excavations], we ran a number of radiocarbon samples, and it’s at about that level … from 2,500 to 3,000 years old,” Hesse said. The fields, the shallow ditches around them, and even the small depressions where archaic farmers placed individual plants of corn and other crops may stretch far and wide throughout the area, he added. “Under the Hohokam sites, there are more of these,” Hesse said, “not necessarily the footprints, but the fields, the irrigation ditches, the little planting depressions. For now, the first order of business is to preserve at least some of the ancient prints, since the site will soon be paved. “We’re doing everything we can to document the footprints, because they are smack-dab in the middle of the road,” said Dr. Suzanne Griset of SWCA, the project’s principal investigator. The nonprofit Archaeology Southwest is conducting 3-D photo scans of the site to create a digital model, and some of the prints have been cast with synthetic molds, while others have been extracted completely to be sent to nearby museums. For Arnit, the excavator and owner of the firm Innovative Excavating, finding the first footprint was an archaeological experience on the order of winning Powerball. “I found what looked like a heel, and then I went up into this area. And it was like the lottery, and this is the last number I’m scratching off,” Arnit said. There are a couple of probably older sets in the SW including footprints in canals on the Zuni reservation ca. 3200bp excavated by ZCRE (though the report wasn’t widely circulated) and also there are the Cuatrocienegas prints as old as 10.5 kya in far northern Mexico. You can read more about Archaeology Southwest’s digital documentation efforts at http://www.archaeologysouthwest.org/2016/01/21/an-adobe-pompeii/. Oldest-bla bla, interesting, but not that relevant. The significance of the find is the scale of the exposure, and of the frozen moment in time. When you walk upon the surface and see the tracks of people going about their lives, and see the modifications they made to their landscape to enable agriculture… It’s a lump in your throat moment. so great to hear of the excitement from the excavator as well! This is cool, but I was more fascinated by the dinosaur tracks in the rocks at Clayton or Clayton Lake, New Mexico, that were discovered when a dam spillway was being excavated. Like a snapshot of the past. I would like to get additional information about this site. How can I be invited to the site to photograph the footprints. I am a Forensic Scientist that studies footwear and bare feet and I find this to be amazing find. I was part of the Strickland Stone find. Can someone help me. No horses or burros had been brought back to North America, and wouldn’t be for over 1,000 years when Spanish explorers reintroduced them. It is amazing what archaic peoples accomplished without the wheel, microscopes, bests of burden (except the llama and alpaca of South America, to take wild plants and to genetically change them from a wild grass or tuber into maize, spuds and gourds. That they erected great buildings, cities, population centers, and use city planning techniques well before Europeans did is a marvel. For whatever reason, they seemed to become far more intelligent as they migrated down the western side of the continents… accomplishing things we, today, either can not do, or can only do with great difficulty using the most modern technologies. There is a great amount of history which has been lost. High level societies which have come and gone, accomplishing great feats, and leaving no clues as to how they accomplished them. And the only way we will ever know for sure the full story is to actually go back in time and study them. Archeology can only go so far before it breaks down into theory. In a thousand years, imagine what future archeologists might think of us if our great civilizations disappeared leaving no documentation. Picture what an archeologist might say after searching through a landfill.